Beef is one of the most popular meats in America. In Texas, we make the best beef. Raised right, like no one else in the world. We think about the quality of the final beef product. Quality you can depend on. Seasoned or simple prepped. Cured. Smoked. Grilled. Barbecued. Americans love beef roasts, ground beef, and beef loin steaks. Waco Beef & Pork Processors: supplying the food industry in Prime and Choice Select cuts of beef in primal and subprimal cuts by the case. Bringing the best cuts of fresh beef to every table throughout central Texas. Certified black Angus beef. USDA Prime Rib Roast. Lean ground beef. Prime brisket. We serve restaurants, caterers, and commercial kitchens that serve our community. We care about your business. We care about your diners. We care about providing the best taste at the highest value. From the restaurant table to the grocery aisle: Waco Beef & Pork Processors offer the best selection of wholesale cuts of beef for commercial kitchens and retail sales. We offer same and next day delivery for many special orders and event catering. Our refrigerated trucks delivery throughout central Texas every day. Every diner deserves the best cut of steak. Waco B&PP helps every restaurant deliver it to them. Best wholesale cuts of beef for any eatery. Delis. Food trucks. Diners. Catering services. Get the right beef to serve to every guest. Delicious taste delivered to your door: Waco Beef & Pork Processors. We welcome specialty orders and cuts. Our trained and experienced butchers can customize the beef you need for your commercial kitchen according to your standards and needs. Looking for non-traditional, non-American cuts of beef? We can cut beef according to Argentine, Brazilian, UK, or other international steakhouse standards. 100% USDA certified organic beef, steaks, and beef products available by special order. Our state of the art facility is Texas state inspected and highest-grade equipment to handle all common and specialty beef preparation. Our packing and freezing techniques are above industry standard. We know what makes freshest, most flavorful beef. We deliver the best to every table. Top wholesale steaks and certified Angus beef from top butchers in central Texas. Prepared perfectly for every table. Waco Beef & Pork Processing: wholesale beef cuts and prime steaks. At Waco Beef & Pork, we love barbecuing. We’ve been doing it for decades and we know a thing or two about the best barbecue flavor. Award-winning Prime brisket. Fresh beef ribs. Mouthwatering steaks ready for a sizzling grill. Top beef supplier to BBQ restaurants famous for specialty cuts of juicy, flavorful beef. Brisket. Prime Rib Roast. Hamburger. Our experienced butchers have received specialized training and precise techniques in top steak preparation. Chuck: Bone-in chuck steaks and roasts that makes savory stew meat. Ground chuck is also perfect for hamburgers. Beef Brisket: Beef brisket is used for barbecue brisket and corned beef. When seasoned and cured, select beef brisket also makes the best pastrami. Fore shank: Trendy cut for BBQ and braising. Excellent top cut for beef stews and soups. Beef Ribs: Ribs contain the beef back ribs, Prime rib, and rib eye steaks, boneless ribeye steaks and roasts. Short plate: Beef short plate includes the short ribs, cut for pot roasts, and skirt steaks. We pre-cut and season skirt steaks for restaurant-ready beef fajitas. Specialized and precise cuts that preserve tenderness. The best marbling. Top moisture and tenderness. Beef Tenderloin: The most flavorful and tender of beef loin cuts, beef tenderloin is cut into tenderloin steaks, filet mignon, and tournedos. With bone-in they can be part of the T-bone or porterhouse loin steaks. Tenderloin is the best cut for a beef Wellington roast. Short Loin: Beef loin is cut into T-tone steaks and porterhouse steaks. Boneless short loins are cut into strip steaks. Less juicy than tenderloin, popular and most requested steaks. Sirloin: The sirloin is cut into the top sirloin and the bottom sirloin. Small cuts of sirloin tips, or “beef tips,” are perfect for stews and even center plate. Round: Beef round cut steaks include the round steak, eye of round, top round and bottom round steaks. Many beef roasts are cut from the round as well. 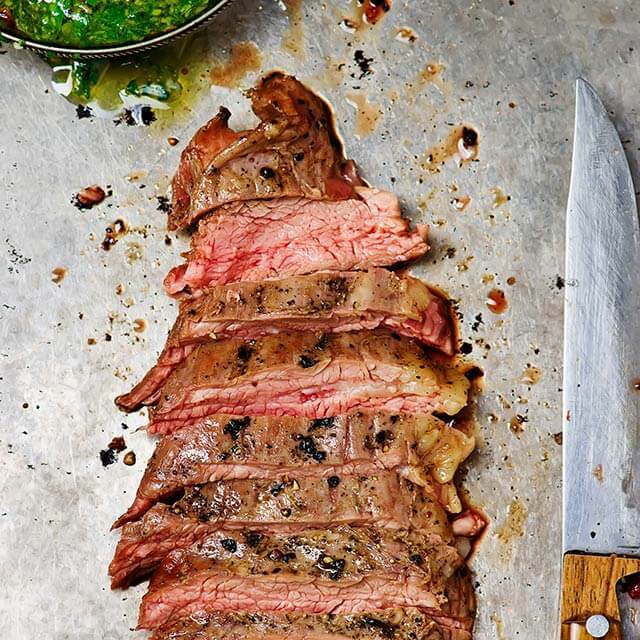 Flank: The best cuts of flank steak and skirt steak are common for London broil and fajitas. They are naturally lean and versatile in many recipes. We know what makes the best burgers. 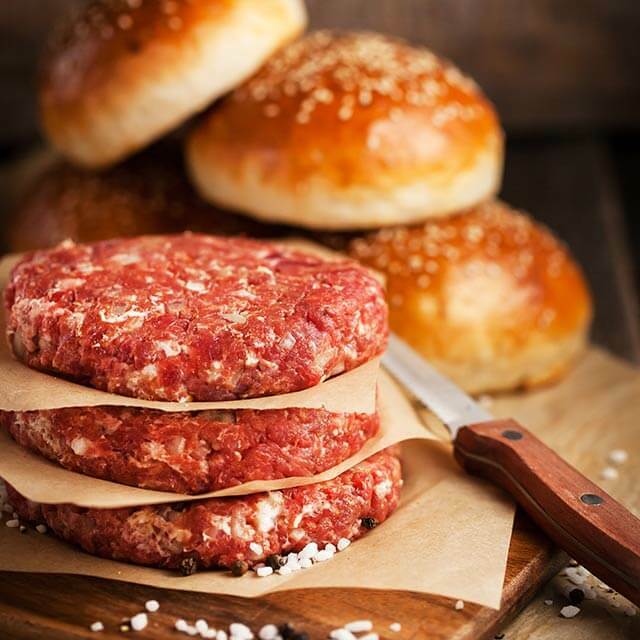 With over 120 years of combined experience as butchers and sausage makers, our team knows a thing or two about ground meat. Waco Beef & Pork offers the finest mixed of ground beef and lean ground beef. 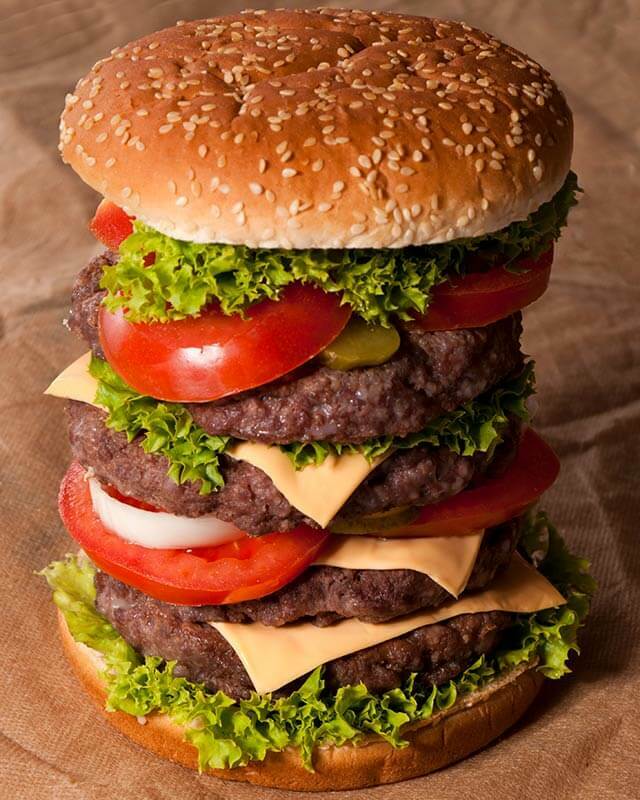 We specialize each order of ground beef to your restaurants needs and recipes. Customize your beef fat percentage for a lean ground beef. Select the grade of beef, including Prime, for the tastiest ground beef. Pre-prepared into 1/4 lbs. or 1/3 lbs. hamburger patties by special order. Waco Beef & Pork Processors: top ground beef suppliers for burger joints and BBQ restaurants across Texas. Our restaurant-ready strips of Choice skirt steak have been cut and prepared for efficiency in any kitchen. 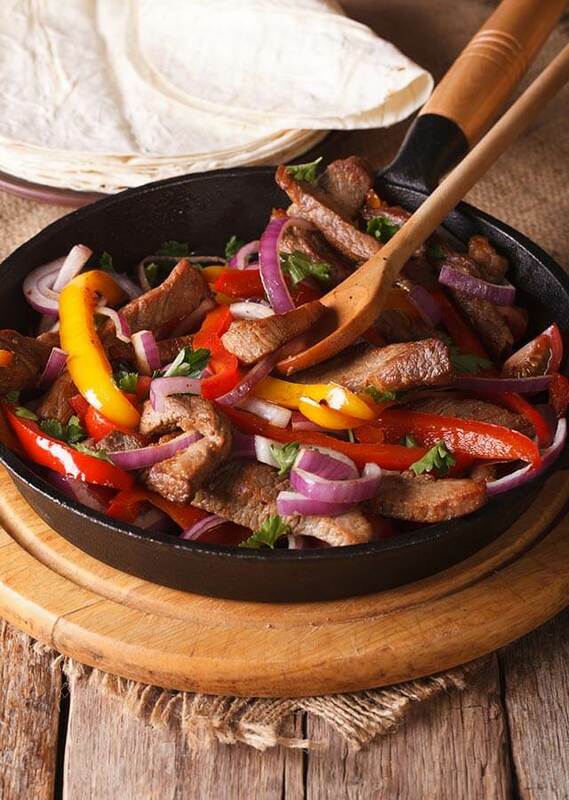 Seasoned with our specialty fajita spices blend and ready to cook and serve. 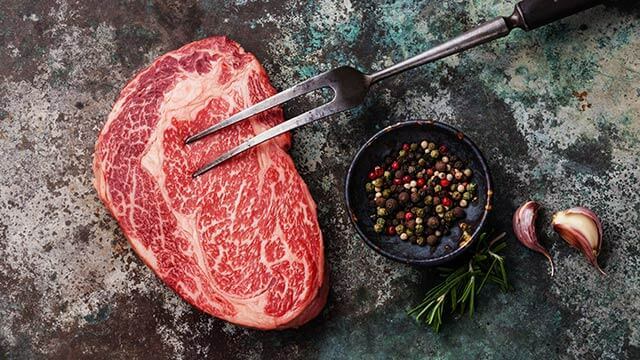 Waco Beef & Pork Processors: the best wholesale cuts of beef for restaurants who love quality. Waco Beef & Pork Processors offer a fine selection of beef offal and trimmings. All our offal and variety meats are processed to the highest standards, ready for specialty gourmet recipes and authentic ethnic flavors. We offer beef tripe, beef tongue, tail, and neckbone. Waco B&PP: all wholesale beef variety meats for your commercial kitchen and restaurant specialties. We smoke our own meat. With over 120 years combined experience smoking meat, our team knows everything about making the best beef jerky. 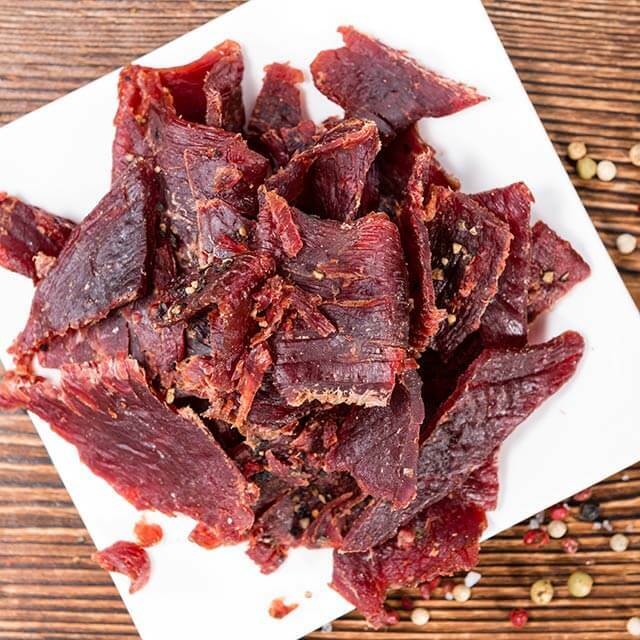 Waco Beef & Pork Processors offers the best selection of homemade wholesale beef jerky for individual retail sale. Seasoned. Spiced. Smoked. Cured. Old World beef jerky and meat snacks with a Texas twist. Bulk beef jerky supplier for central Texas retailers, convenience stores, grocers, or outdoor supply stores. USDA Prime Beef: What Does That Mean? What Makes a Cut of Beef “Prime”? The United States Department of Agriculture (USDA) grades beef based on the fat content and its distribution, as well as the age and preparation techniques of beef. Preparation and Cut: Prime beef must be cut professionally to ensure the best quality and care for all cuts of meat. Less than 3% of all beef produced is graded as Prime Beef, the top level of certification from the USDA. Prime beef is the juiciest, most tender, and most flavorful beef available. 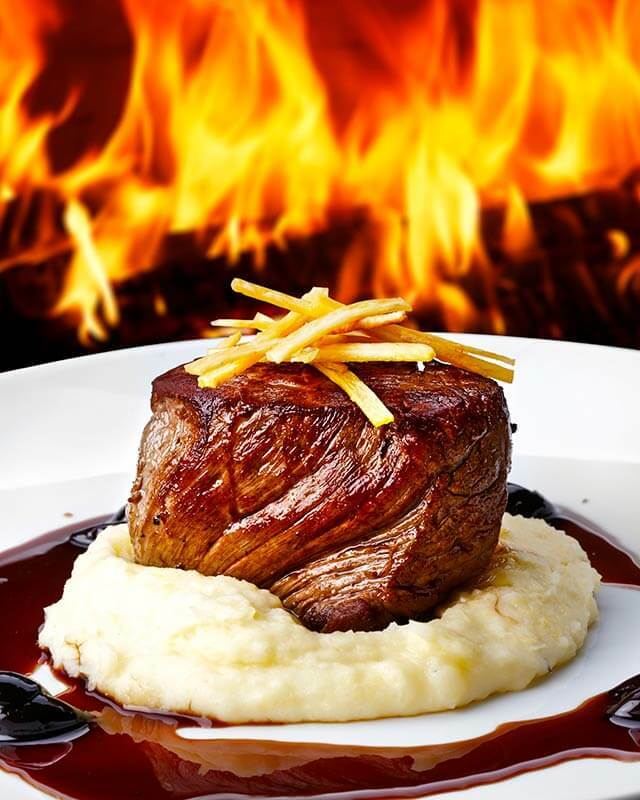 USDA prime beef is often served at the top restaurants and steakhouses across Texas. Top selection of Prime Beef. Top local wholesale meat for commercial kitchens, restaurants, and catering services. Waco Beef & Pork: Top wholesale beef suppliers in the central Texas area offering Certified Angus Beef and Certified Angus Prime Beef. Top brand trusted and loved by consumers for the most flavorful, juiciest beef. Choice beef has a less-even fat distribution than Prime beef, but maintains a tenderness through some marbling. Choice wholesale beef is widely seen on menus at a variety of restaurants. Many steaks, beef short ribs, and beef fajitas are Choice cuts of beef. Select grade beef has less fatty marbling and may be older beef with a less refined cut. It is still deliciously appropriate for many restaurant and commercial recipes, including stews and ground beef hamburger. The most common wholesale beef cuts today, including most meat served at top restaurants, delis, caterers, and commercial kitchens is Choice or Select grade beef. We specialize in the best cuts of Choice meat. Select available by special order. Waco Beef & Pork Processors offers top cuts of Prime steaks and beef, as well as a selection of Choice and Select wholesale steaks and cuts of beef. USDA Inspected Facilities. Best USA Beef. 100% USA Products. 100% USA Proud. 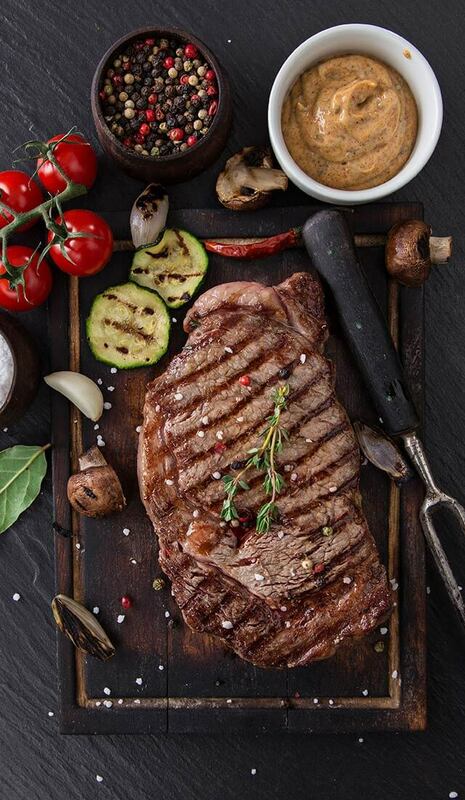 The best steaks on any table come from farmers who care, the highest quality and safety standards, and meat processors with expertise and dedication. We offer USDA Certified Prime Beef cuts. Proud supplier of Certified Angus Beef and Angus Prime. Recognized consumer favorite for best taste and texture. From top suppliers throughout Texas and neighboring states to the tables of central Texas top restaurants, caterers, and delis. The best central Texas wholesale beef suppliers: Waco Beef & Pork Processors.